• Control equipment for the water supply and wastewater industry. The Purewater range of GRP housings are manufactured from the highest quality materials to withstand the rigours of the harshest weather conditions. All enclosures have a tough weather resistant polyester gel coat outer, reinforced with a laminate incorporating an encapsulated polyurethane foam core to provide insulation. External colour options are RAL6005 Green or BS 00A05 Industrial Grey. Other colours are available on request. Insulation is 25mm thick as standard. This can be increased to a maximum of 100mm for extreme temperature applications. Door furniture includes stainless steel hinges and fixings, Yale type nightlatch lock assemblies, External door handles, internal door check straps and stays. 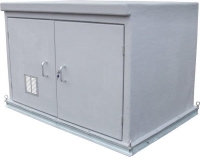 Smaller GRP enclosures are available as a single piece unit which are normally delivered to site palletised and only require fixing down to a structural slab or raised kerbing. Larger enclosures are constructed in a metric modular format and can be assembled at our works for delivery as a single unit or where access restrictions apply, be supplied in sections to allow assembly on site. On-site assembly is carried out by our own, directly employed engineers. Purewater do not use sub-contract labour for enclosure assembly. Encapsulated ply backing boards for electrical components and switchgear. Tubular heaters and thermostats for frost protection. Screened spill over screens to the housing walls to comply with water regulations, backflow prevention. Factory prepared pad areas to allow for pipework to pass through housing walls. Single or double door assemblies. Access manways to housing roof for applications where space restrictions apply.